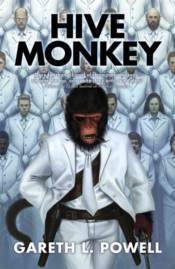 The stunning follow-up to Ack-Ack-Macaque, which featured the Spitfire pilot monkey hero of a computer game who turned out to be real. The first book was met with wide acclaim upon release. In order to hide from his unwanted fame as the spitfire-pliot-monkey who emerged from a computer game to defeat the dangerous corporation who engineered him, the charismatic and dangerous Ack-Ack Macaque is working as a pilot on a world-circling nuclear powered Zeppelin. But when the cabin of one of his passengers is invaded by the passenger's own dying doppelganger, our hirsute hero finds himself thrust into another race to save the world - this time from an aggressive hive mind, time-hopping saboteurs, and an army of homicidal Neanderthal assassins!